Roughly ten-percent of the population is left-handed with most left-handers exhibiting some level of ambidexterity, necessitated from living in a right-hand dominated world. More than a few people asked when we would again manufacture a left-hand folder. The resulting Military Model met the criteria with a CMP-S30V modified clip-point blade and glove-ready 14mm oversized Spyderco Round Hole. Jimping above the hole secures the thumb in contact with the blade's spine for control over the cutting edge. G-10 handle has a nested (inlayed) LinerLock stepping-up lock strength without bulky liners. Scale spacers running the length of the handle exposes the folder’s inner workings for visual inspection and cleaning. Flares on both ends of the handle keep the hand steadily engaged with no forward or backward slipping if you’re sawing or aggressively cutting. We topped it off with a curved metal clip position for left-hand tip-down carry. And we made it in Golden, Colorado. Nester Linerlock®. G-10 laminate handle scales. Spine & choil jimping. Screw-together construction. 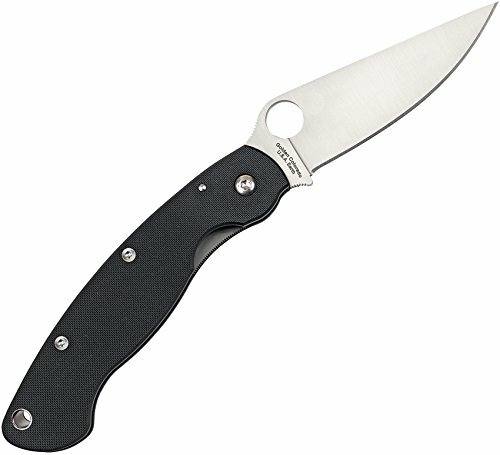 14mm Spyderco Round Hole (for a gloved hand).